The Internal Revenue Service agrees that releases and withdrawals of lien notices were not always processed timely or properly and has committed to making changes to procedures, the Treasury Inspector General for Tax Administration said in a report released Aug. 22, 2012. When taxpayers neglect or refuse to pay their taxes, IRS can file notices of federal tax liens with local government offices to protect the federal government's right of priority against certain third parties, such as purchasers or creditors. The IRS policy changes and outreach efforts have resulted in significant increases in the number of lien withdrawals requested by taxpayers. Withdrawal delays, the agency watchdog said, can cause unnecessary burdens on taxpayers while untimely releases could violate taxpayers' rights. The Internal Revenue Service (IRS) attempts to collect Federal taxes due from taxpayers by sending letters, making telephone calls, and meeting face-to-face with taxpayers. A claim, commonly referred to as a Federal Tax Lien, attaches automatically to a taxpayer’s assets for the amount of unpaid tax when the taxpayer neglects or refuses to pay. The IRS files a Notice of Federal Tax Lien (NFTL) in appropriate local government offices to protect the Federal Government’s right of priority against certain third parties, typically purchasers or creditors. The IRS can file an NFTL on the taxpayer’s property for one or multiple tax periods that contain an outstanding tax liability. The IRS also has the statutory authority to re-file the notice to continue protecting the Federal Government’s priority interest, when applicable. In addition, the IRS is required to release the NFTL to protect the taxpayer’s rights after the taxpayer meets various conditions. 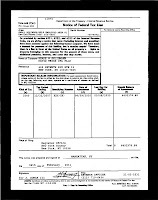 In some cases, the IRS may withdraw the NFTL, such as when it is filed in error. If the IRS determines not to re-file the NFTL, a self-releasing provision6 will extinguish the notice 30 calendar days after the original Collection Statute Expiration Date. If the IRS determines that re-filing is necessary, the Centralized Lien Processing Operation (CLP) will input and process the NFTL re-file through the Automated Lien System (ALS). The Internal Revenue Code (I.R.C.) 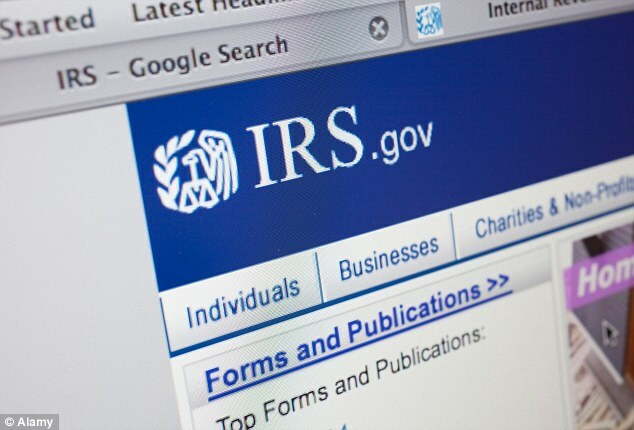 authorizes the IRS to withdraw an NFTL when certain conditions have been met. For example, a withdrawal may be issued when it is in the best interest of the Federal Government and the taxpayer or will facilitate collection of the tax liability. Withdrawal of the NFTL removes the public notice of the lien; it does not extinguish any remaining underlying liability, nor does it prevent the IRS from collecting any unsatisfied tax liabilities. Taxpayers and IRS employees request NFTL withdrawals through the Small Business/ Self-Employed (SB/SE) Division’s Advisory function or Insolvency function because these two functions have the authority to approve withdrawals. If approved, the CLP processes and prints the withdrawal certificates (Form 10916(c), Withdrawal of Filed Notice of Federal Tax Lien) and sends it to the proper recording office. NFTL releases The IRS has legal and internal policy requirements to release the NFTL within 30 calendar days of the date that the tax liability is fully satisfied,the liability becomes legally unenforceable, or the Secretary of the Treasury has accepted a bond for the assessed tax. The release of an NFTL is generally systemically generated after all the tax periods on an NFTL are satisfied; however, in some cases, the IRS should request a manual release. The taxpayer may also request a manual release in situations that warrant expedited processing or request an immediate release which can be prepared upon the receipt of certified funds. 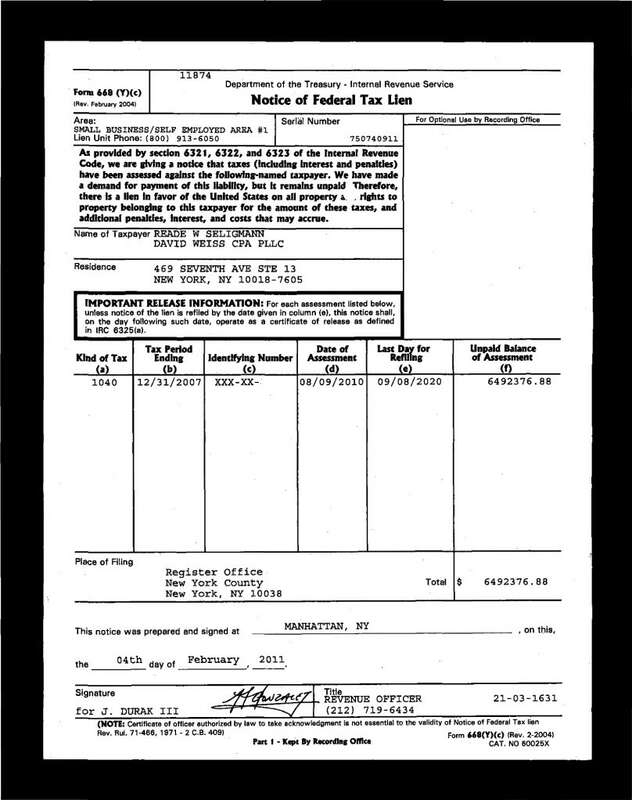 The CLP prints Form 668(Z), Certificate of Release of Federal Tax Lien, and mails it to the proper recording office. In some circumstances, such as an immediate release, revenue officers and Taxpayer Assistance Center employees may issue the release certificate directly to the taxpayer upon receipt of certified funds. 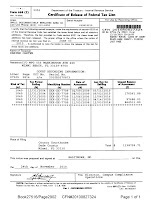 The taxpayer can then personally file the certificate with the recording office. The Government Accountability Office reported that, despite actions taken to improve its NFTL release process, the IRS was not consistently releasing NFTLs timely, as required by the I.R.C. The Government Accountability Office estimated that in Fiscal Year (FY) 2009, 14 percent of the NFTLs were not released timely due to processing errors and delays. Marini & Associates, P.A. 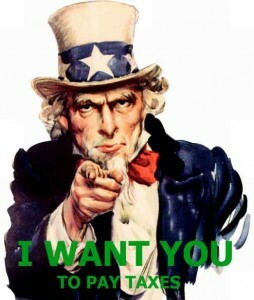 for a FREE Tax Consultation at www.TaxAid.us or www.TaxLaw.ms or Toll Free at 888-8TaxAid (888 882-9243). Payments to the former owner of an insurance brokerage business were not disguised purchase price payments, the U.S. Tax Court held Oct. 15 (H&M Inc. v.Commissioner, T.C., No. 16612-09, T.C. Memo. 2012-290, 10/15/12). The owner of H&M Inc., a small corporation, sold its insurance brokerage business to a bank, then went to work for the bank, which paid wages to H&M Inc. and interest payments to Harold Schmeets. Holmes said both parties were “genuinely interested in creating an employment relationship and were not just massaging the paperwork for its tax consequences.” There was virtually no discussion about the tax consequences of the transaction and the parties treated the transaction as an asset sale and employment relationship. The Court found that the payments Schmeets received under the employment and salary-deferment agreements were not disguised purchase-price payments to H & M. H & M is therefore not liable for the section 6662(a) penalty on this issue. If you have Tax Problem, contact the Tax Lawyers at Marini & Associates, P.A. for a FREE Tax Consultation at www.TaxAid.us or www.TaxLaw.ms or Toll Free at 888-8TaxAid (888 882-9243). A tax whistleblower received a $2 million reward from the Internal Revenue Service for his role uncovering an alleged multimillion-dollar tax-avoidance scheme attempted by Illinois Tool Works Inc in the late 1990s. The informant is a Wall Street banker who remained anonymous to protect his career. Last year, the IRS Whistleblower Office awarded him $1.1 million for information about abusive tax shelters allegedly set up by Wall Street banks to help Enron evade taxes on more than $600 million of taxable income. The individual testified about the IRS whistleblower program in 2004 as a confidential witness, known as “Mr. ABC,” before the Senate Finance Committee. Most tax-whistleblower cases take between 5 - 7 years to be resolved, in part because whistleblowers aren't paid until after the IRS is paid and the taxpayer's time to appeal has expired. If you want to be a Wistle Blower or are Victum of a Wistle Blower, contact the Tax Lawyers at Marini & Associates, P.A. for a FREE Tax Consultation at www.TaxAid.us or www.TaxLaw.ms or Toll Free at 888-8TaxAid (888 882-9243). Since 2001, the filing threshold has gradually increased from $675,000 for 2001 deaths to $3.5 million for 2009 deaths. The estate tax was temporarily repealed for 2010 deaths, but was later reinstated on a retroactive basis with a $5.0 million exemption level and a top marginal tax rate of 35 percent. This exemption level and top marginal rate will stay in effect for the estates of 2011 decedents. • Due primarily to increases in the filing threshold, the number of estate tax returns filed decreased from more than108,000 in 2001 to just over 15,000 in 2010. • For Filing Year 2010, estates with gross assets above the filing threshold reported over $130 billion in assets. • Almost 61 percent of 2010 estate tax decedents were male. Just over half of all decedents were married, while another 36 percent were widowed. Only 13 percent of decedents were single, divorced, or separated. • Over 97 percent of the estates of married decedents, and 48 percent of estates overall, reported deductions for marital bequests, for a total of $42 billion. Only 9 percent of estates with a marital bequest owed estate tax. • About 20 percent of estates claimed a charitable bequest deduction, for a total of $11.5 billion. Estates with $20 million or more in gross estate accounted for over 63 percent of this total, despite representing only 6 percent of filers. • After accounting for marital and charitable bequests, as well expenses and debts of the estate, less than half of the estates filing in 2010 owed estate tax. The combined estate tax obligation of these estates was over $13 billion. Have and Estate Tax Question? 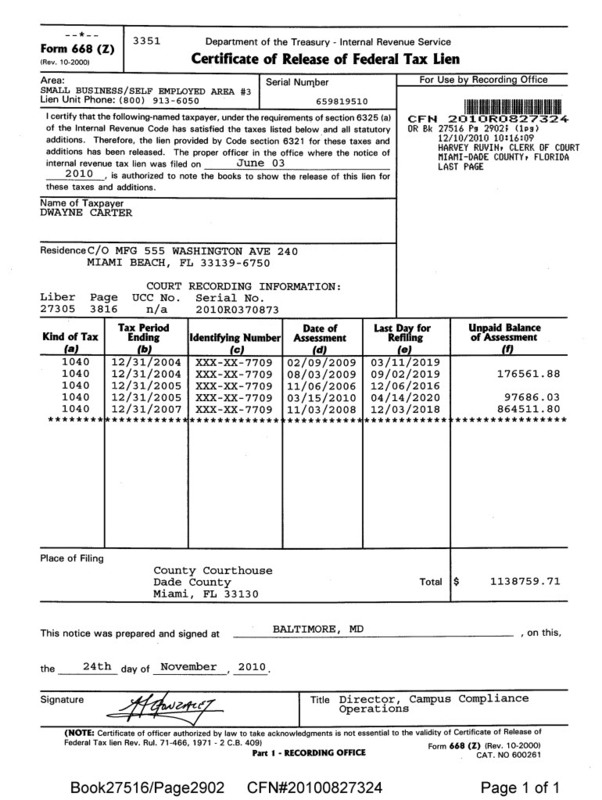 Contact the Tax Lawyers at Marini & Associates, P.A. for a FREE Tax Consultation at www.TaxAid.us or www.TaxLaw.ms or Toll Free at 888-8TaxAid (888 882-9243).